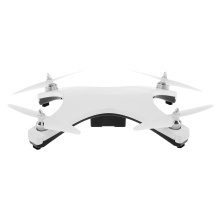 This 2.4G GPS drone has super beautiful white appearance which is sure to catch people&apos;s eyes. GPS positioning system and altitude hold function enable you fly more stable than other normal drones. 1800KV brushless motors provide huge power. The drone has the function of auto return – when the drone is lost of control or low voltage it will auto return. Take this nice tracker drone home and enjoy your flying time. Functions: One-key take off/landing, up/down, turn left/right, side flight, headless mode, slow/quick speed switch, auto return, LED, GPS. 2.4G remote control to enhance distance control of the transmitter to 300 meters for the ultimate flying experience. GPS positioning system and altitude hold function offer a super stable flight. One-key return, low voltage auto return, headless mode, and loss of signal auto return functions worry-free lost your drone. Super bright LED lights aid in orientation and work beautifully for night flying. One key to turn off the light under normal mode. 1. The Drone has GPS function. Please fly the drone outside or at open places and make sure that there are at least 8 satellites are received. 2. Caution for the battery: Don&apos;t over-charge, or over-discharge batteries. Don&apos;t put it beside the high temperature condition. Don&apos;t throw it into fire. Don&apos;t throw it into water. 3. This RC model is not a toy and is not suitable for children under 14 years old, keep it away from children. Carefully read the instruction before any use, if you are a beginner, it&apos;s advisable to be assisted by an experienced adult.